Must Waiting Be Inherent To Medical Care? “By the time you see the doctor, you’re either dead or you’re better,” my mother-in-law told me. 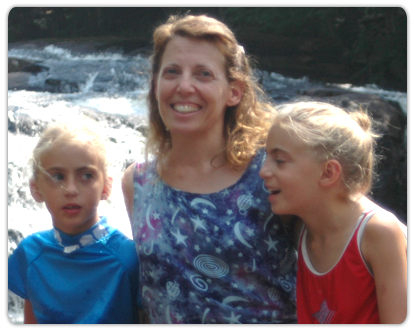 She had to have multiple tests, all with long waits to get the appointments and the results, before her health insurer would allow her to make an appointment with a specialist. “Waiting is the bane of the medical system,” a former student, an R.N., concurred. Advances in medicine and technology have improved medical outcomes, but have often resulted in more waiting at a time when every other aspect of life is speeding up. Waiting is a systemic problem exacerbated by advances in medicine and by health care reform. Wait to see if the symptoms go away or get worse. We all struggle with these decisions: do we need to be seen about the fever, back pain, or rash? Sometimes we wait because of denial or hopelessness; sometimes because of the cost or availability of medical care. I make decisions about when I need to see the doctor by asking myself if, under the same circumstances, I would take one of my children to the doctor. Wait to get an appointment scheduled. I’ve made appointments for a sick child by channeling an old friend who could be relentless: “That is not acceptable. I need an appointment today.” Obnoxious but it sometimes worked. The rest of the time, though, the period between making and having an appointment can feel very long. Wait to get to the appointment. Doctors and hospitals are more abundant in Greater Boston, where I live, than in other places, although traffic and parking can be problematic. Melody Smith Jones described a man’s six hour commute to see a doctor. Wait to be seen by the doctor. It isn’t called the waiting room for nothing. Dr. Atul Gawande wrote in The Checklist Manifesto about people in the waiting room getting irate when he was running two hours behind on a hectic day. Being irate – or anxious or bored – is unlikely to increase the quality of physician-patient communication. Wait in the examining room. At least in a waiting room you are dressed. If it is cold and you are wearing a paper or cloth johnny, distractions don’t work as well and examining rooms have fewer than waiting rooms. See the doctor. Nowadays, as my mother-in-law recounted, you have to wait for the doctor to review your records before even looking at you. I find it surprising that physician rating systems give equal weight to wait times as they do to “communicates” and “listens”, when the latter are so much more important. Wait in the lab. The selection of magazines is skimpier. You may be reviewing what you were told not to eat or drink: will that cup of black coffee skew the results? Wait for the doctor’s interpretation of lab results. Lab results can be hard to decipher without clinical training, as my student said above. Even when I know results are available and the doctor has seen them, it can take many phone calls to obtain the doctor’s message via the secretary. Asking the doctor follow-up questions takes even longer. These are waits with a cell phone never turned off so you don’t miss the call. Loop. You think you’re done but you may need to see a specialist, get a second opinion, or have more tests. As my mother-in-law pointed out, this process can be controlled more by insurance companies than by doctors’ availability. Another type of waiting also takes place now: waiting to get better. A friend bemoaned how she “couldn’t wait” for her black eye resulting from a fall to clear up because she was tired of people staring at her. Schedule tests and doctor’s appointments together. My exercise teacher told me about her husband’s hospital visit that started with a CT scan and ended with a doctor’s appointment to discuss the results. With no problems detected and a year until they next visit, they both said what a relief it was to get it over with quickly. Scheduling appointments together reduced both waiting time and anxiety, although not all tests results can be interpreted this quickly. Personally I find it is much easier to deal with a diagnosis than fear of what a symptom could mean. Avoid unnecessary appointments through email or phone. A Dutch friend, whose sister and aunt are doctors, recounted instances when she was able to get quick answers by email or phone to questions, be reassured, and save a lot of time and effort. One instance: “Once I was on holiday in Greece and sent my sister a picture when my eye was infected. She told me to buy drops and that it would go away.” Since most people do not have convenient relatives with medical degrees to talk to, being able to easily reach a doctor or nurse by email could provide a way to get a quick answer. Dr. Danny Sands has long been a proponent of physician-patient email, but most practices do not support it. I can easily see the benefits because email forces you to describe a situation concisely and images can be attached as appropriate. Ask the expert. Self-proclaimed experts and community-verified experts provide advice in many sites like Yahoo! Answers. 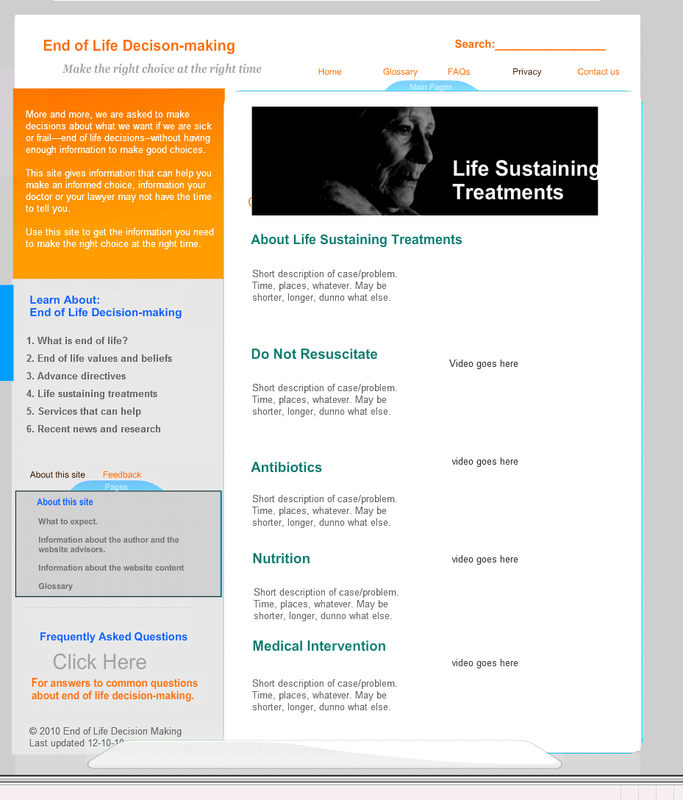 Recently there has been a proliferation of sites supporting health Q&A. A new entry, HealthTap, promotes that it has “Answers from 5,000 U.S. licensed physicians. No waiting room.” I tried it and questioned why I needed to answer so many personal questions during the registration process. Once registered, I started to ask a question but was stumped by how much context to provide. In general one of the things I like about Ask the Expert is the ability to browse other people’s questions – sometimes you learn more from questions you never would have thought to ask – and answers. Use clinics for non-urgent care. I had a friend who believed that it was important to see the same doctor because he or she could notice changes that might not otherwise be detected. While I agree, the Minute Clinic (note the name) model can potentially reduce some of the use of doctors for non-urgent care. Enhance health literacy skills. With 80% of US internet users looking online for health information, better health literacy skills are needed to guide the strategies used to seek, select, and use online health information. This is rarely taught in schools or by doctors, and is increasingly necessary because of the lower barriers with social media: it is easier than ever to promote herbal supplements and bad advice. Make waiting fun – or at least less stressful. Deirdre Walsh, a health coach and a former student, said, “The pain and frustration of endless waiting seems needlessly cruel. But it’s often the emotional toll of fear and uncertainty that does the most damage from the negative effects of stress chemicals on energy, sleep and mood. If waiting is inevitable, there are self-awareness exercises that restore calm, power, and the sense of control. ” Games and gamification have potential as well: a version of “Wait, wait… don’t tell me!” for the waiting room? Is there an app for that? Not that I know of, but social media is being used by public health departments to post flu clinic waits and by emergency rooms to post wait times. What about for doctor’s visits? Dr. Richard Besser said, “You shouldn’t have to wait more than 15 minutes unless there’s an emergency. Social media might be a great place for people to share waiting times.” Along those lines, I read about, but have not tried, WaitChecker, a web-based service to alert patients to appointment delays. Set expectations. The metaphor Trisha Torrey uses is “when you arrive at a busy restaurant on a Friday night, what’s your question to the host? How long is the wait? It’s only fair that providers manage our expectations about wait times, too.” It is easier to be patient with expectations set, not just for the length of a wait but the course of a disease. Use waiting time on task. A student once told me that she had a rash when pregnant and assumed it was unrelated to her pregnancy. She searched for information on her iPhone while in the waiting room, decided it might be related after all, and asked her doctor, who treated it. She saved another doctor’s appointment. What if all waiting rooms provided mobile devices? Or promoted prevention with education, exercises, and healthy snacks. Talk about captive audiences. It is important to maintain perspective: quality of health care is paramount. Everyone wants the best care possible and sometimes waiting is unavoidable. With no health advantages to waiting, put , as Dr. Ted Eytan said, “the patients’ cost of care, which includes the time they spend waiting, into the equation. Everything follows from that.” There is no reason to accept that it’s part of our health system, but, instead to work to reduce waiting, and to reduce the impact of waiting. Given the difficulty healthcare consumers have in locating useful and reliable health information, I took note of SiteJabber.com both because of their model of website reviews and because they are supported by a grant from the National Science Foundation. I interviewed Jeremy Gin, their CEO and co-founder, who calls SiteJabber a consumer protection service that helps people avoid fraudulent websites, find good sites, and contribute reviews. The site has information on over 100,000 websites, including 6403 health sites, and is visited by over 400,000 consumers every month. They were named one of the top 100 websites of 2010 by PC Magazine. Lisa: Health website quality is arguably more important than any other type of site. How does SiteJabber address quality issues? Jeremy: We certainly share your concern about the quality of information available to consumers on the quality of healthcare sites. Our role is publishing community reviews on the quality of healthcare sites, and our own data gathering and surfacing of useful information that might not be easily available to consumers. In terms of the quality of information on SiteJabber, we go through great efforts to limit the impact of spam on our site through technology, administrative review curation, and community review curation. Lisa: Do you ever ask people to review sites or have people on staff doing reviews? Many health sites seemed to be reviewed by one person, Rod G.
Jeremy: Most of our reviews come from Online Consumer Advocates. These Advocates are typically possess a wide-range of expertise—think modern-day Renaissance men and women—and care deeply about helping other consumers and making the internet a better place for everyone. We are very thankful and lucky to have a number of these individuals who have dedicated a large amount of their time to supporting our cause. While we do not pay reviewers, Rod G. is one of our co-founders and an MD, so has written a number of reviews of health sites. In the coming months, we will be inviting more healthcare experts (MDs as well as others) to review sites. Right now we have a “reviewer level” system which lets readers know the relative trustworthiness of reviewers. We’re also about to introduce a more robust system which will incorporate authority specific to healthcare. Lisa: Why do you show the HONcode logo for some sites? I ask this because so many healthcare consumers don’t know what it is. Do you think it adds credibility? Jeremy: In the health field, we believe HON Seals provide useful information. For those who haven’t heard of it, it is a non-profit based in Switzerland which vets healthcare sites for information quality, conflicts of interest, etc. However, I would point out that HON Seal information is offered only as a data point to consumers, not the ultimate judge of a website’s quality. For example, sites such as Psychcentral and Dailystrength are HON certified but our reviewers have brought up legitimate issues with these sites that we believe consumers should be aware of as well. Lisa: Do you like controversy in reviews, such as those on Quackwatch, which is one of the few health sites I found with multiple reviews? Jeremy: Controversy is not something we seek out—our chief concern is providing transparency and useful information for consumers—but sometimes controversy finds us, in which case we do our best to keep the discussions focused on giving people something useful to read. Lisa: How does social media fit into your model? I see you use Twitter and Facebook, and have a blog as well. Jeremy: Social media has been important to us in the past and will be increasingly important going forward. We use our blog to communicate broadly with our community and the general public; so if we notice an emerging scam we can let everyone know, or if we come up with some tips for consumers in a particular subject (like health), we can post those as well. We also publish illustrative graphics on topics we believe are important to consumers, such as the counterfeit pharmaceuticals trade. Blog posts are broadcast through our Facebook Fan Page and Twitter account and often syndicated by The Atlantic, Fast Company, and AOL’s Consumer Ally so they can reach more than our usual base of visitors. In addition, our reviewers can use their own Facebook and Twitter accounts to broadcast their own reviews. We’re presently working on a deeper integration of social media so our reviewers can make their SiteJabber experience an extension of their Facebook experience, if they so choose. Metrics show which approaches are successful and justify the expenditure. Social media metrics are tricky because obvious ones, such as numbers of fans and followers, may not be the measures indicating success at achieving goals. Develop a message, create an audience, analyze, adjust, and engage. For the uninitiated, this translates to: Dr. Richard Besser, chief health and medical editor of ABC News and former acting director of the CDC, is running a Twitter chat about disaster preparation. I participated in the chat because disaster preparedness was on my mind after being interviewed earlier in the day about how social media is being used in Japan and because I follow Dr. Besser and wanted to see how he conducted his chat. I participate in the weekly #hcsm chat when I can and lurk in others, so it’s fascinating to compare moderation techniques. The chat, by the way, was lively, informative, and well-attended. 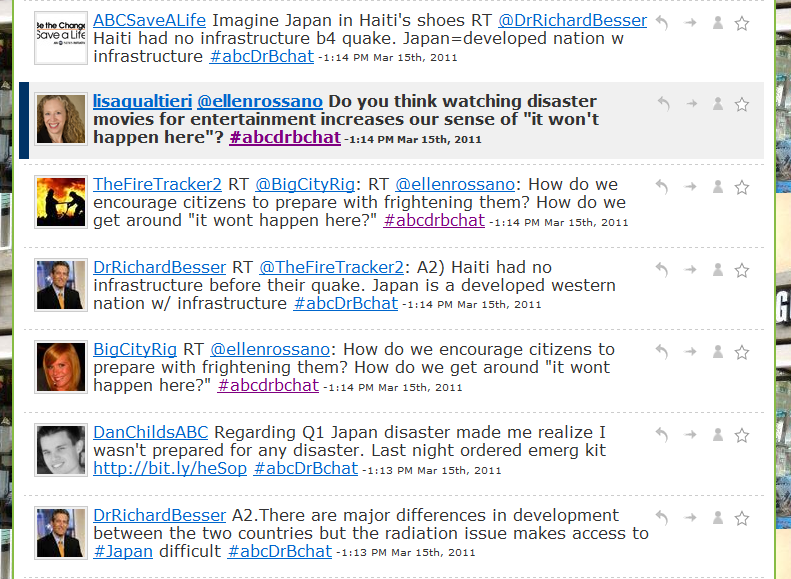 My personal highlight was when Dr. Besser retweeted me and then @ABC retweeted him! I was in my office at Tufts School of Medicine and the door was open, so colleagues came by and enjoyed looking over my shoulder (they fell in the uninitiated category and were uniformly impressed that Dr. Besser wasn’t). 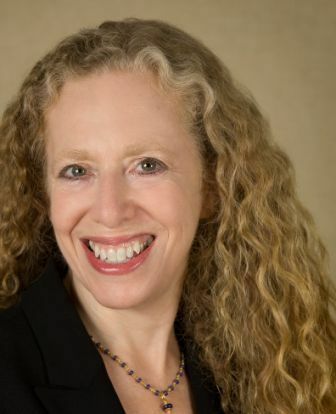 After the chat ended, I contacted Dan Childs, aka DanChildsABC, who heads the Health section of ABCNews.com, to ask how Dr. Besser’s weekly chat started, how it is conducted, and what happens after the hour is over. Lisa: Who had the idea to start the weekly chat with Dr. Besser? Dan: This was actually an idea that was hatched during a discussion between a few of us on the Health team and Niketa Patel, the Social Media Producer for ABCNews.com. We had wanted to do something special that would allow Dr. Besser to connect more directly to his audience through social media, and Niketa offered up this idea. This is the first such effort for a correspondent here at ABC News, so we’re the trailblazers in a way. Or the guinea pigs, depending on how you look at it. Trailblazing guinea pigs. Lisa: Did he like the idea? Dan: Dr. Besser loved the idea. ﻿﻿﻿Lisa: This was my first chat with Dr. Besser but I see there is another next week. When did they start? Dan: Today was our fourth Twitter chat so far. We started about a month ago. Lisa: How are topics selected? Dan: Generally, the chat crew will share ideas either in a meeting or online. As with the chat today about disaster preparedness, we try to pick topics that are in the news and, therefore, within the public consciousness. Last week, Dr. Besser tweeted from Africa on issues of global health in the developing countries there. We try to pick something that is relevant, but also gives participants a feeling of going beyond the headlines to explore how these current issues are relevant to them. Lisa: I was very impressed that Dr. Besser was supported by ﻿﻿@LaraSalaABCNews, @BigCityRig, @CarrieHalperin, and @DanChildsABC. What actually happens during the chat? Dan: Several members of the chat crew set up laptops in Dr. Besser’s office, while others of us participate from our offices and desks. Certain members of the chat crew will be responsible for certain aspects of the chat; one may be tasked with presenting questions during the chat, while another will be in charge of scouring ABCNews.com for articles that are relevant to the discussion at hand and posting those links. It is also usually helpful to have one or two people navigating various external sources on the web to ensure that all tweets we put out are based on the most current and reliable information available. Lisa: What happens after the chat to review how it went? Who is there and what is the discussion? Are there noticeable changes the following week? Dan: This is generally a discussion that takes place in the course of our Health team morning meetings, and then more informally throughout the day as we think of the things we learned from the previous chat session. What is great about this whole process is that the product has evolved pretty much constantly since its inception – every time we do this, we do at least one or two things a little bit differently. Sometimes these adjustments are small ones, probably barely noticeable to our audiences. But then there are larger changes that really seem to have an impact. In our most recent session, for example, we were able to coordinate with ABCNews.com to have the tweets appear in real-time in a text box on the Home Page and the Health page of the website. So when something like that happens, where the rest of the eyes in the network can see what you’re doing and how you’re interacting with the audience, that’s pretty exciting. End-of-life decision-making is an increasing pervasive topic that has personal, political, legal, and, of course, medical implications. George Lundberg, MD said that “every American deserves the right to choose to have a death with dignity and as pain-free as medical science and practice can provide. To achieve that, patients and physicians must discuss the options for managing an upcoming death.” Atul Gawande, MD wrote in Letting Go: What should medicine do when it can’t save your life?, “But rarely is there nothing more that doctors can do. They can give toxic drugs of unknown efficacy, operate to try to remove part of the tumor, put in a feeding tube if a person can’t eat: there’s always something. We want these choices. We don’t want anyone—certainly not bureaucrats or the marketplace—to limit them. But that doesn’t mean we are eager to make the choices ourselves. Instead, most often, we make no choice at all. We fall back on the default, and the default is: Do Something. Is there any way out of this?” Gawande told about La Crosse, Wisconsin, where, by 1996, 85% of residents who died had written advanced directives. 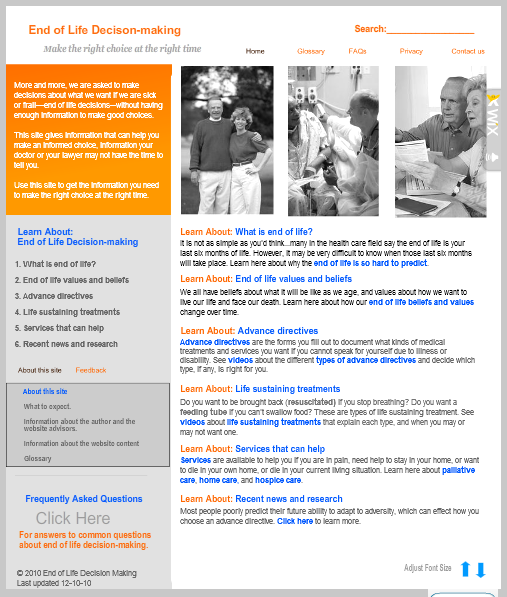 Help users clarify their understanding of their beliefs and values regarding end of life, treatments, and services, including that beliefs and values are situational and change over time. Provide the types of information users need or want regarding advance directives, life-sustaining treatments, and services that extend or support the end of life in order to make informed decisions. Engage first-time users and invite reuse because the website is attractive, well laid-out, and easy to use, and contains information that is relevant across many stages of decision-making. While being part of a well-known and reputable organization can have many benefits, not having a visual identity can be a liability on a website intended to help people. 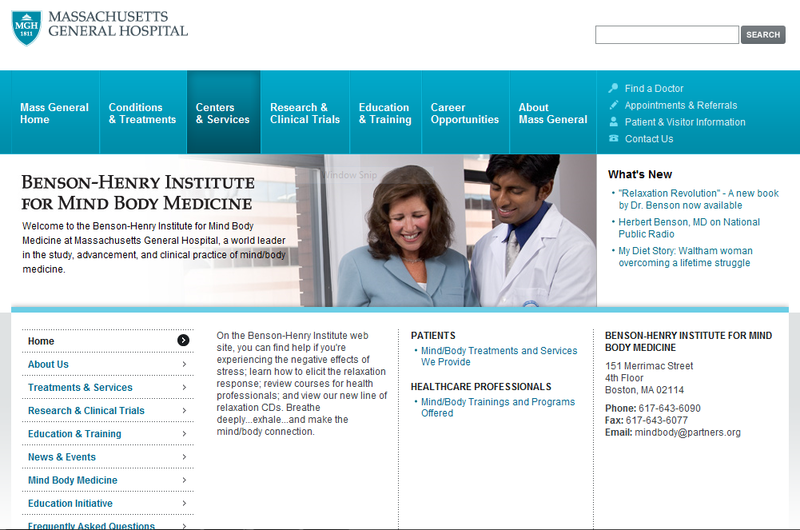 This is the case with the Benson-Henry Institute for Mind Body Medicine at Massachusetts General Hospital, whose website provides little information without exploring. 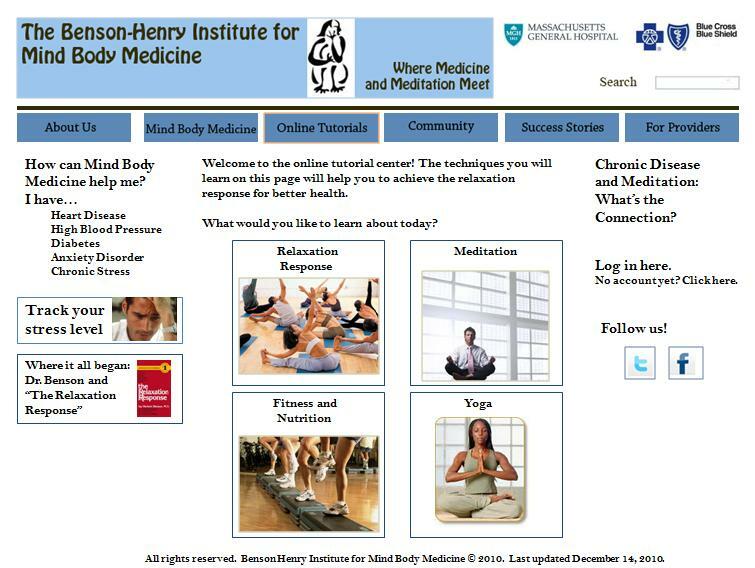 Claire Berman, who is working on a Master of Science in Health Communication at Tufts University School of Medicine, was a student in my Online Consumer Health course and, for her project, redesigned the Benson-Henry Institute (BHI) site. Her process included the development of personas, such as Paul, a 35-year -old Newton, MA resident with a stressful job and a family history of heart disease, who is skeptical about complimentary and alternative medicine (CAM). Paul needs to understand immediately how BHI’s website may be able to help him when viewing he views it for the first time, especially because of his skepticism. Claire developed other personas, and showed that the current site design and structure is unlikely to appeal to them or provide them with the information they are seeking. With BHI’s goal to “improve the health status of site users through mind-body relaxation techniques,” Claire’s recommendations for a different look and content are likely to help them achieve their goals. Read Claire’s final paper, with personas who can benefit from BHI’s content and a competitive analysis looking at Gaiam Yoga, Center for Mind Body Medicine, Mind Body Medicine Center, and Mind Body Medicine.